In recent days, Joe Biden's consideration of a presidential bid seems to have moved from the "just flirting with the idea" phase to the "time to put a ring on it" stage. On Monday, there was yet another huge sign that the vice president is edging closer to making his campaign official: sources told CNN that Obama gave Biden his blessing to seek the top job as the president's successor. 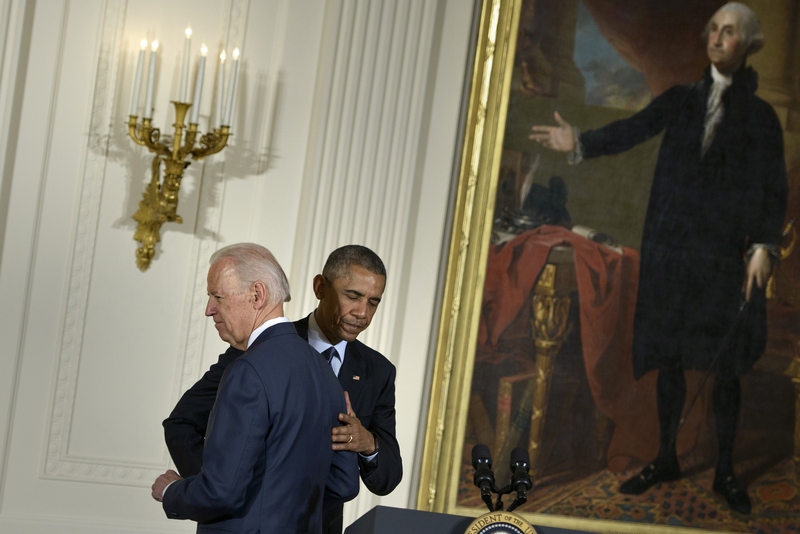 While Biden doesn't need Obama's permission to seek the Oval Office, the President said he would not stand in the way, according to CNN, or advise against a Biden campaign. This is far from the first strong signal from the Biden camp that he is planning to seek the Democratic nomination for president, in a challenge to Hillary Clinton and Bernie Sanders. (Which, of course, puts Obama is an awkward position — Bernie can be ignored, but would he endorse his former secretary of state, or his ex-vice president? Decisions, decisions.) Politico reported on Monday that Biden had hired Kate Bedingfield as his communications director. She was a former spokeswoman for John Edwards' 2008 campaign, who has, according to Politico, "campaign chops." But there are plenty of other signs as well. CNN reported on Saturday that Biden and Warren recently met privately and talked about economic policy. A source told CNN that the discussion lasted two hours and the presidential campaign "was not a particular focus of the discussion." The meeting, of course, led to speculation that Biden was trying to persuade Warren to join his campaign, possibly as his running mate. Warren hasn't endorsed anyone yet, but she adamantly refused to mount her own presidential bid, despite heavy persuading by devoted followers. The Washington Post reported that Biden has invited several "major Democratic fundraisers" to meet with him at the vice presidential residence following the Labor Day holiday. He'll need to get moving with fundraising fast, because Hillary Clinton, ever organized, has already raised plenty of money to fund her campaign. The speculation around a Biden run began in earnest earlier this month, when Maureen Dowd of The New York Times wrote that as Biden's son Beau was dying of brain cancer, he urged his father to run for president. Dowd painted a heartbreaking picture of the conversation between the father and son. Whatever Joe Biden decides, it's clear he's giving this decision a lot of thought, and won't be rushed into making up his mind.